to the Academic and Corporate Learning Management Systems. Though these two approaches may be very different, it appears as if everyday solutions are providing a means to bring them closer than many would care to believe. In principle, these two types of systems offer the same foundation for their intended organization. This groundwork includes the ability to house, execute, and reward learning in either environment. Beyond this basic foundation, we quickly encounter immediate differences, and in order to understand where these two separate entities are beginning to merge, we must first take a brief moment to understand the severity of these variances. The manner in which education is perceived varies uniquely between these two platforms. This is most identifiable in how the LMS presents itself and how the learnings are organized in each environment. 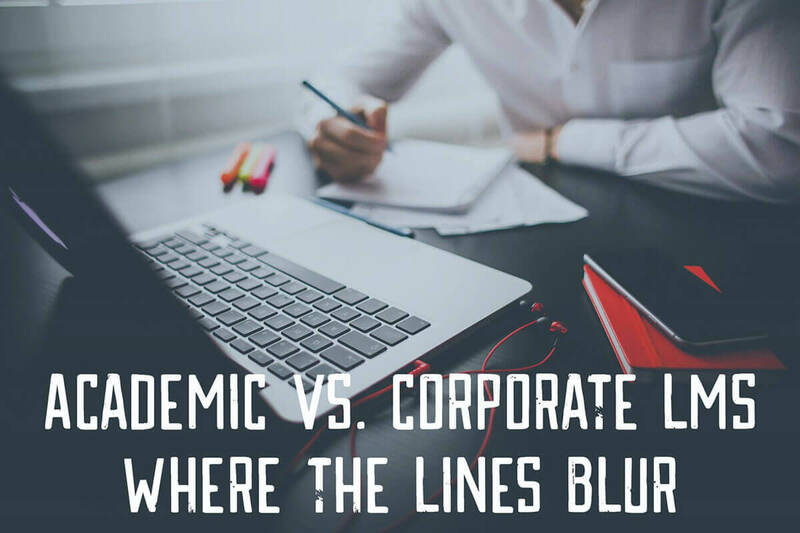 In an Academic LMS, a learning path is defined by a variety of options that do not exist in the corporate realm. Collegiately, this could be a Bachelor’s Degree in Marketing, with intense emphasis on prerequisites and the specific output of grades. In the employee training realm, these learnings are typically grouped by position, department, region, and a variety of other factors. The goal output of educational LMS are forming a foundation of understanding on a chosen path of learning, whereas employee training is strictly ROI (Return on Investment). In these two separate methods of LMS, some of the terms are the same, but are alarmingly different in implied meaning. Here we will take a quick look at critical vocabulary for each system type, and apply a written definition to further comprehend these differences. Syllabus: Overall course outline, with an overview of what is expected and links to corresponding materials. Courses: We can define a course as an overall themed learning, with a set duration of weeks, comprised of many classes. Classes: a furtherance of courses, allowing for instruction and defined building block learning style. Tests: Typically tests are defined as examinations administrated to segment class learnings or personal learnings. Occurring at pre-defined increments during a course, culminating in a final exam, to ensure measurability of overall learning. Quizzes: Occur weekly/bi-weekly to reinforce class assignments and instruction. Gradebook: In the education realm, grades are very important. They allow teachers and administration to measure a student’s amount of correctness, and an overall average of cumulative courses. Which creates an all-encompassing student profile on individuals for reporting purposes. Calendar: In the company realm, syllabi are not required. The work comes first and foremost and the training follows to improve career activity and function. As such, it is more important that a workload can be traceable from an administrative perspective. This in turns shapes the methods behind courses. Courses: In the business realm courses are no longer many week events (with significant exceptions based upon organization), instead they are one or two days, with a span of specified time, or a collection of e-learnings to be completed by a certain time. Classes: Often used interchangeably with “course”, as course instances may only include one class. Tests: eLearnings occasionally accompanied by one final certification exam. I’ve hinted at this in my above definitions; semesters, as opposed to business’ quarterly scale is one very noticeable difference. In the business setting there is no real defined ending (people can work at an organization for a year, of stay there for 40). Whereas in the educational role, the time scope is very well defined 4 years for an undergraduate, 13 years for k-2, and depending on post-graduate studies there are defined rules of duration. For each setting, files must be kept on hand for if a student/user swaps an internal organization or role, or changes their course of study. In the educational LMS realm, there are clearly defined grade levels, which coincide with a full year of usage. In the business world, it may be contingent to re-take a course yearly. Courses mean different things. In business, a course could be a single 3-hour instruction with an evaluation at the end. Whereas in the educational world, a course refers to many instances of a class, and all of the materials that fall under its umbrella. What are the students getting out of this? In the academic world, the goal is to lay a foundation of knowledge of which a student can access later in life/ later in their career. In the business world, the typical goal is to introduce new materials in a defined and regimented way, reinforce policies, and create a structured actionable methodology which can be repeated. How are they supported? Reinforced in the educational class setting via instructor, multiple assessments, and social interaction with peers. In the business realm, this is more of a self-exploratory study. Find your way to an answer, own that answer, and make it promote the business as a whole. Operation: Baseline operations, How the LMS works, what people are being tested on, and how they interact with the content. Both areas are trending towards each other as new advancements are proving to create a better uptick in appealing to the user’s independent motivation. Brand: Branding is always important. The practice of quality branding allows users to be familiar with their environment, as well as extend the reach of an organization’s marketing practices! Branding options are comparable regardless of what type of system you are encountering. Social: The addition of social platforms is becoming a trend in the business world. Currently, the usage of discussion boards and wikis are best suited in the academic field, but this is changing. Professors’ talk to their students, students discuss learning topics, then work with one another to produce materials. The possibilities are quite enticing when discussing the corporate learning community. Hosting: With the ever-changing demands of users, hosting requirements have changed as well. With an influx of commuters and the tendency for corporations to fall into multiple time zones. It is becoming more and more practical to have a reliable connection to the content from anywhere the user may be. APIs: Though used less in the academic realm, the existence of pre-built APIs aid in the functionality of most academic systems. The ability to diversify program hooks could go a long way in reshaping the usefulness of academic systems in the very near future. Single Sign On: As more and more educational tools become available, the need for SSO will become more necessary in academic environments. Currently, this is a principle focus of the corporate community.